Red Bull KTM factory rider hasn’t given up his hope of being World MX2 Champion in 2014. Here are some comments from the Dutch rider on his injury and recovery. ”I was riding in the 85cc class and Roan van Moosdijk was leading, but I could not follow him properly. I had already resigned myself that I could not beat him in the first moto, just at that point I lost control of my bike and fell hard. When I was on the ground I wanted to get up, but this was not easy, and when I looked at my leg, I knew it was not right. I was then transported to the hospital. “My thigh is currently still very swollen, but the doctor said I should try to move it. Today I start with therapy and if all goes well I can go home even today. The therapy will usually consist of lasering on my leg, in order to accelerate the healing process. 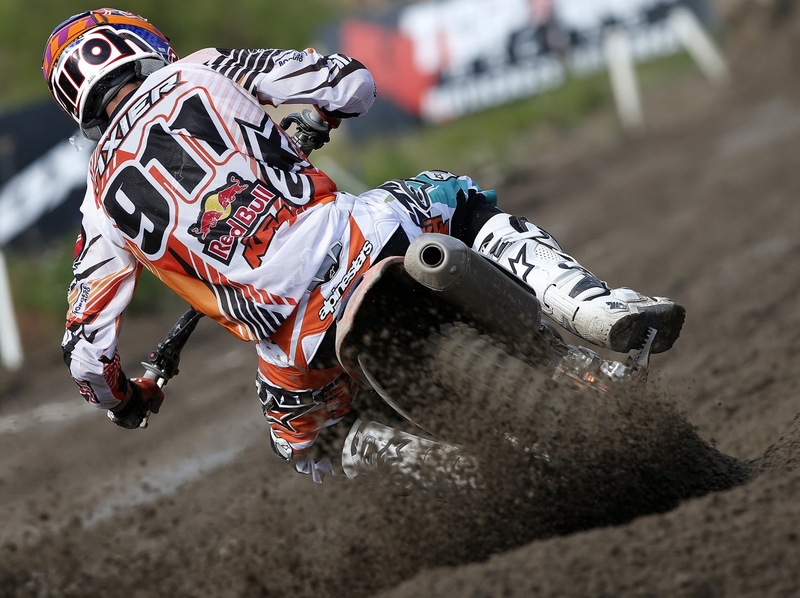 Click here for "Herlings - Behind his success!" Jeffrey Herlings can still win the 2014 250 title by sitting at home, hoping Tixier has bad luck or by showing up in Mexico. Depending on how the rehab for his broken femur goes, Jeffrey Herlings has three options to win the 2014 FIM 250 World Championship (for the third straight time). (1) Strategy One is simple—stay at home, heal up and leave the outcome to the fates. If his leg doesn’t heal quickly, then there is little he can do but hope that his 145-point lead over Jordi Tixier will hold up. Jordi Tixier can win the title—if he can finish in the top three every moto or get seven fourth place finishes and one third in the next 8 motos. If Arnaud Tonus (200) and Glenn Coldenhoff heal up in time to race a couple 250 GPs, they could be the wild cards that steal points from Jordi Tixier. (3) Strategy Three is the last ditch effort (and it is based on the current sad state of GP motocross). Given the poor rider turnouts for the 2014 GP series, Jeffrey Herlings could hope to rehab his broken femur from July until just before the final race on September 14 in Mexico. Then, show up in Mexico and earn a couple points—based on the fact that everyone who shows up in Mexico will probably earn points. That gives Herlings two months to recover enough to ride his bike—and he doesn’t have to ride it fast. This is Herlings’ bail out plan (but it has ramifications for his health in the long run). There are four GPs left —the Czech Republic this weekend, Belgium next weekend and then there are five weeks off before the final two races in Brazil on September 7 and Mexico on September 15. 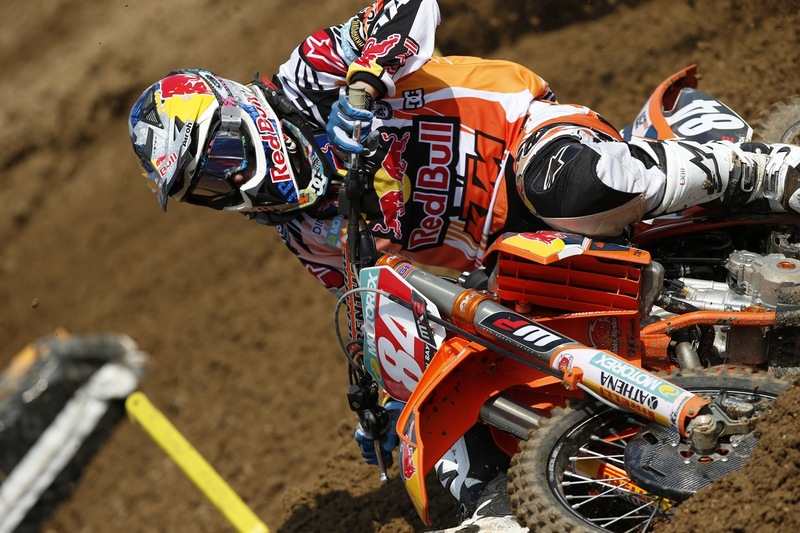 Red Bull KTM factory rider Jeffrey Herlings has broken his thigh at the Stefan Everts Charity race. The leader in the MX2 World Championship might miss the remained of the season, and his Unadilla trip seems over for sure. With just a handful of points needed to be crowned World Champion it is hard to know if Jordi Tixier could gain enough points in the last four rounds to be crowned World MX2 Champion. Tixier would need to score around 35 points at each GP to win the title if Herlings can’t come back. Tixier has shown problems under pressure, so it’s a huge order for him. Tixier is yet to score more than 40 points per GP this season, although with Herlings out points will be easier to come by for all MX2 riders. He has scored 40 points on six occasions. Of course Romain Febvre and Dylan Ferrandis are still within 200 points of Herlings and could also win the title, but the chances of those guys winning are unlikely being around 180 and 190 points behind. They would need to go with around 45 and 47 points at each GP. Neither rider has come close to scoring that amount of points in a GP in 2014, the best by Ferrandis 40 points in the opening round and at the GP of Spain, and Febvre scored 40 points just once. With two months before the end of the season it is possible Herlings will come back if he needs a few points to win the title.